In Cuba, Door Opens To Property Market For the first time in 50 years, Cubans can now buy and sell residential real estate. The new law allowing such transactions is President Raul Castro's most significant economic reform measure to date, and is spurring the refurbishment of the island's long-neglected homes. For the first time in 50 years, Cubans can now buy and sell homes. Here, a Cuban woman stands on the balcony of a dilapidated building earlier this month in Havana. First-time visitors to Havana immediately notice two things about the city: the graceful architecture of its buildings, and the fact that so many of them are in ruins. But walking through the crumbling Centro Habana neighborhood this week, there was another sight: homeowners beating back the decay on nearly every block. That's because a new law takes effect Thursday allowing Cubans to buy and sell residential property for the first time in 50 years. 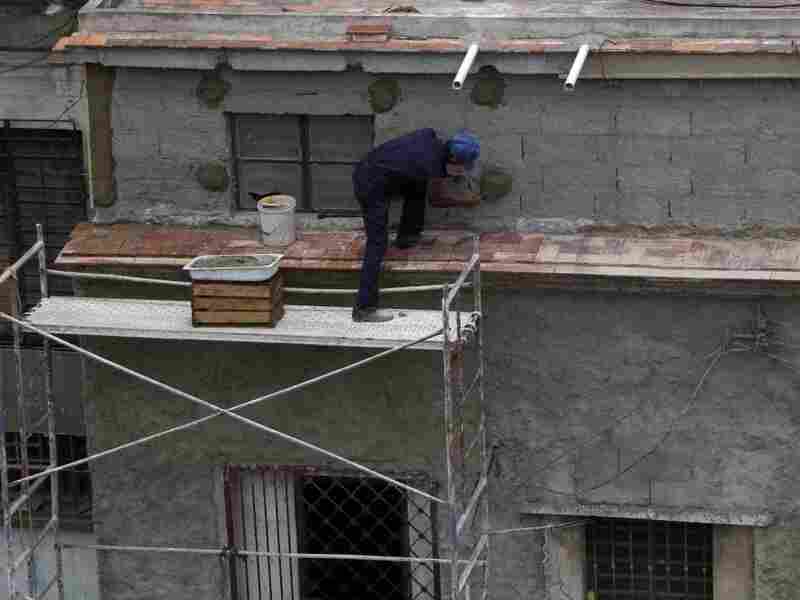 Antonio Gonzalez repairs the facade of a house in Havana in May. The new law means many property owners are now updating long-neglected buildings. Well-kept single family homes in prime neighborhoods are listed at $100,000 or more. The reform measure may be President Raul Castro's biggest nod to market economics yet, with the potential to attract millions in investment capital from abroad, and transform Cuba's neighborhoods. Antonio Tresol and his son are among those giving their home a makeover. They heave cement blocks off a delivery cart, finally fixing an exterior wall on their home that had been patched over with ugly sheets of scrap metal. The buildings on this street are spider-webbed with cracked masonry. Paintbrushes haven't touched them in decades, and their once-elegant iron grillwork is now brown and chipping with rust. But with new loads of building materials available in state stores and everyone now talking about what their houses may be worth, Tresol has a new interest in appearances. "We're making it look beautiful again," he says about their home. For the past half-century, there hasn't been much incentive for Cubans like Tresol to fix up their homes, never mind the lack of money and materials. Fidel Castro's communist revolution made nearly everyone a homeowner, but barred them from buying or selling their property, allowing only complicated "trades," while others made illegal black-market deals. Now, millions of cash-poor Cubans suddenly have a valuable liquid asset, and no one quite knows what will happen next, says Havana architect and urban planner Miguel Coyula. "Havana is a city that [appears] to be a city frozen in time. And now you suddenly open the market. You can buy, you can sell. And the question will be, in my opinion, the impact of this in the society, in the market. We are opening a new opportunity, a new field, for which we are not completely prepared, many people are not prepared," he says. Small apartments in rundown sections of Havana are now listed for $5,000 to $10,000 in online classified ads. Well-kept single family homes in prime neighborhoods are expected to go for $100,000 or more. But those fire-sale prices may not last. 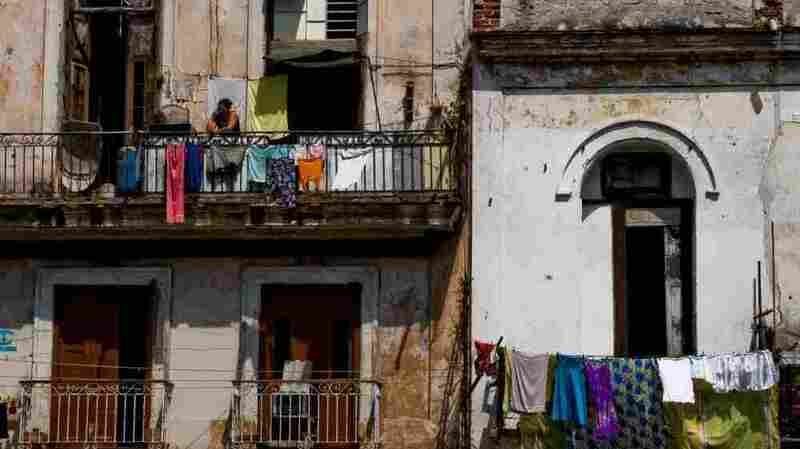 The new market is expected to draw big dollars from Cubans living abroad who will buy or repair property through their relatives, since legal ownership is restricted to Cuban citizens and permanent residents. Jorge Gonzalez, a black-market cement vendor, gives a tour inside a seven-story Havana apartment building constructed in 1926. Though the building's original elevator still works, cracks as wide as a rum bottle spread through the structure. Buildings like this one are probably too far gone to save, Gonzalez says, but others will be restored, as long as government stores can keep construction supplies in stock. "The government is finally giving people a chance," says Gonzalez. "In the past, if they caught you with black-market construction materials, they would confiscate them. But now the state is making them available, and everyone is motivated." Cuba's government isn't opening the door to a free market free-for-all. Homeowners will still be limited to one property in the city and one vacation home. And with no mortgage financing available and large sums of cash involved, buyers will have to go through government banks and prove they amassed their funds legally. Still, with so much pent-up demand and many seeing a different economic future for Cuba, no one seems to doubt that the money will be there.